No more short and annoying cables between your computer and RC transmitter. 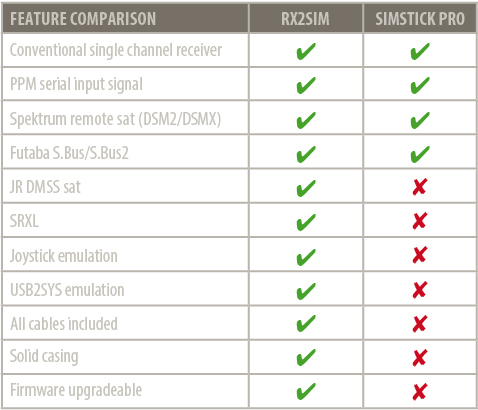 RX2SIM allows to convert nearly any RC simulator on the marked to work wireless. It can be used in combination with most radio control systems. All you need is a transmitter and receiver that has sufficient number of channels for your application. There is no need for a trainer port on the radio anymore. RX2SIM connects your RC receiver with the simulator dongle. The control signals are transmitted from the receiver to RX2SIM via the supplied patch cable (included in box). You can use a conventional receiver with standard servo output ports as well as common serial signal/singleline receivers (supported protocols are PPM, Futaba S.Bus, SRXL, Spektrum DSM2/DSMX, JR DMSS). 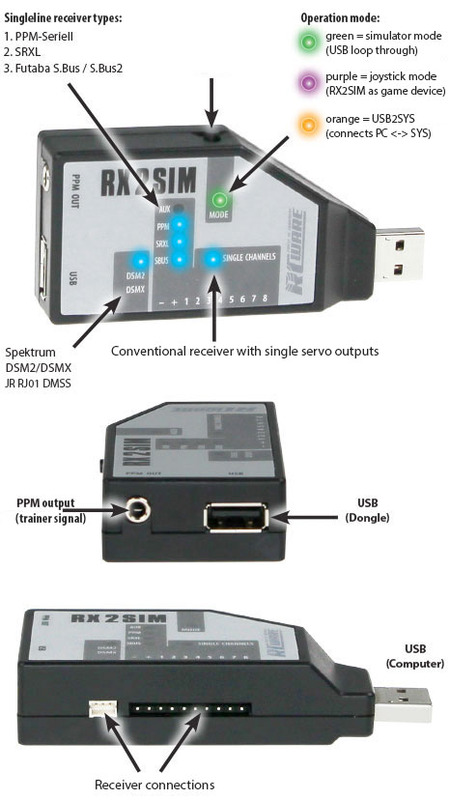 RX2SIM converts the incoming control signals into a trainer signal that can be used by the simulator interface dongle. Also you can use RX2SIM as wireless joystick (gaming device) to control any computer program that uses a joystick interface. Especially this allows to control RC Simulators that do not supply any special usb interface dongle like 'neXt - CGM RC Flight Simulator‘ or most shareware simulators. The RX2SIM firmware is user upgradeable with the BEASTX StudioX application. So the device is future-proof in respect to additions like emerging serial signal receiver protocols.